UConn’s sports teams were known as “The Aggies” before the husky mascot was adopted in 1934. There was a period of about a year, though, when the teams were called byanother name. What was it? April 27, 1979, was “The End of the World” at UConn. What happened that day? A: The athletic teams left their longtime home in the Yankee Conference. B: An all-male dorm, on the verge of going coed, hosted a wild party. C: Dining halls stopped serving beer to comply with new state regulations. D: Historic Orford Hall was torn down after half a century of use. In 1944, Dean of Women Mildred French imposed a new restriction on female students, the violation of which could result in suspension or expulsion. What were UConn women prohibited from doing? Since UConn’s Greek Life community launched Huskython in 2000, the dance marathon has raised nearly $4 million for Connecticut Children’s Medical Center and become one of the University’s signature student events. But what was its original name? 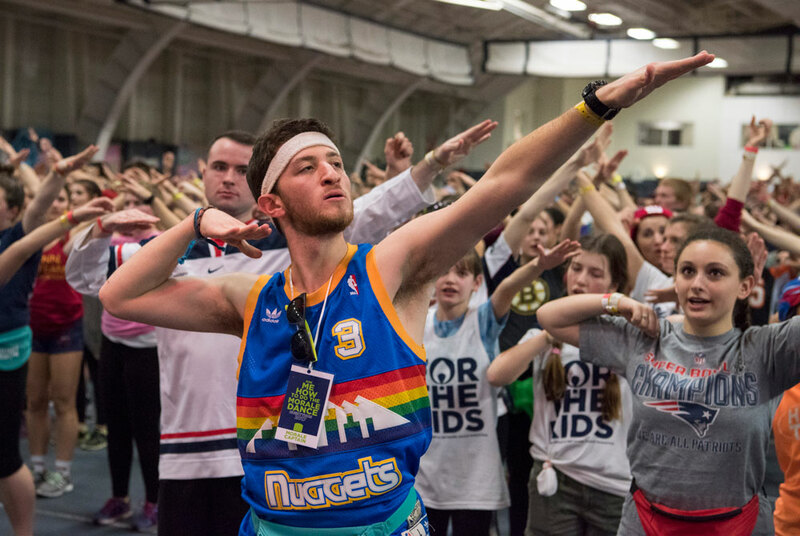 A Morale Captain leads dancers at the Greer Fieldhouse during Huskython 2017, which raised a record $836,174.52 “for the kids” at Connecticut Children’s Medical Center. On Feb. 17, 2018, dancers hope to raise $1,000,000 for the Center during the 18-hour marathon. C. In 1934, Connecticut Agricultural College was renamed Connecticut State College, and for roughly a year before Jonathan's arrival on campus, the teams were nicknamed the Connecticut Statesmen. B. The Harriet Beecher Stowe residence hall, in the old South Campus, was scheduled to switch from an all-male dorm to a coed dorm the following fall. Students responded by organizing an "End of the World Party" that resulted in thousands of dollars of damage, burned furniture, smashed windows, and coverage in Newsweek and the New York Times. A. 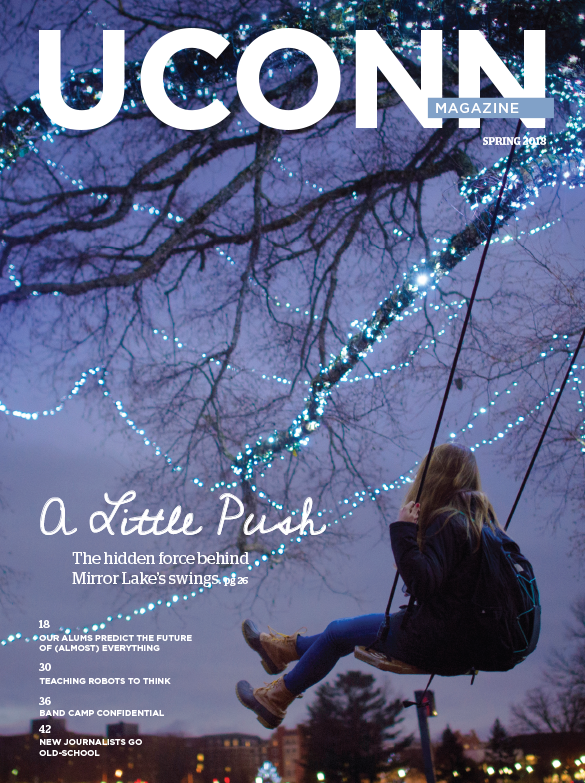 The then-popular practice of "hitching a ride," in French's view, reflected poorly on the reputation of the women students at UConn. Women who walked along roads were instructed to face traffic, to avoid being accused of hitchhiking. D. From its humble origins as the Husky Midnight Marathon in 2000, the 18-hour event has grown to be one of the largest student-run philanthropies in the Northeast. That first year, the event raised $13,878 for the hospital; in 2017, the figure was $836,174. Miss French also forbid women from wearing “trousers” on campus unless they were going to gym classes. Smoking only permitted in certain rooms in the dorms. Ever wondered how many are left from the class of 1948?? ?I’m one of the younger ones at 91. Returning vets were much older.